A couple days ago, I mentioned that it’s moth season. 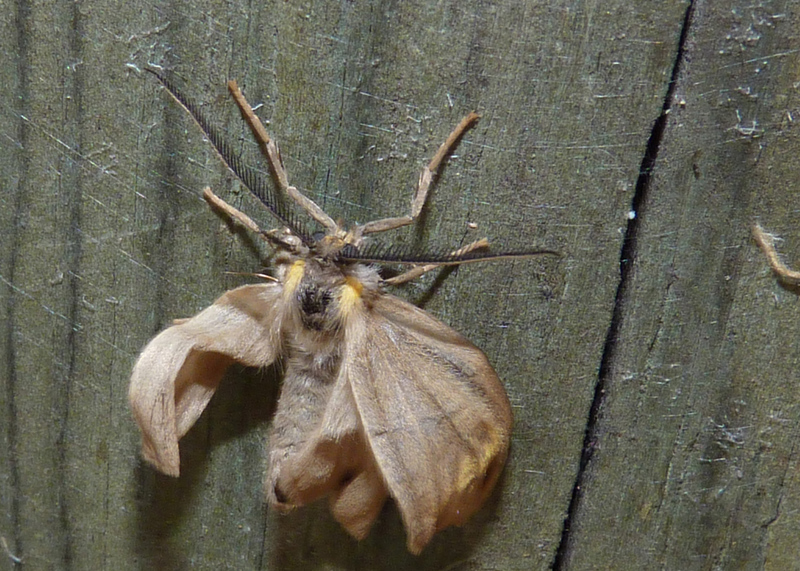 These are the moths that do a pretty good job of imitating dead leaves. And they’re everywhere. Today, I walked over to Stanford and around the dish loop. 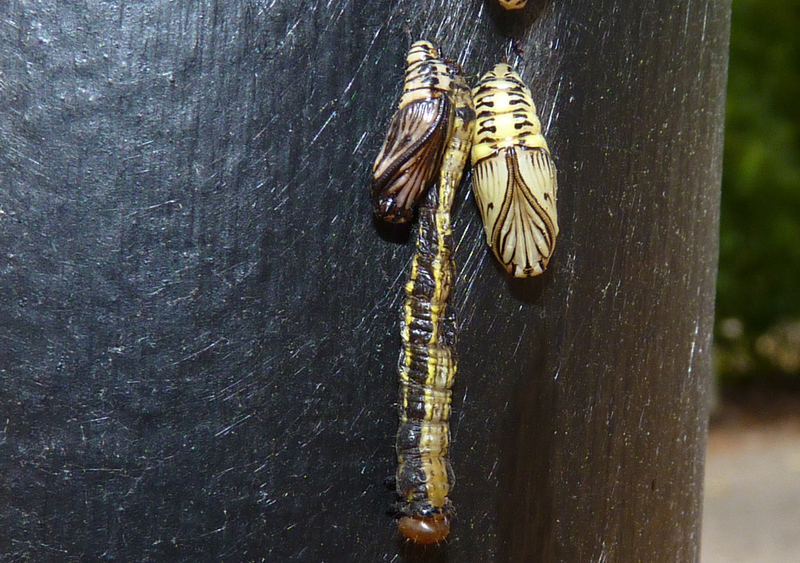 I stopped at a particularly dense area of pupae to see if I might observe a moth in the process of emerging. 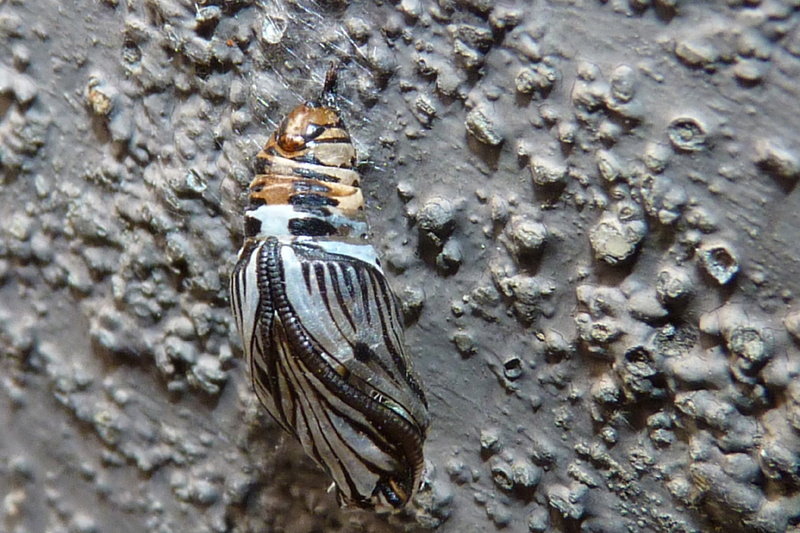 No, but I think this may be a larva in the process of pupating, soon to resemble its two neighbors. Either that, or it’s dead, dead, dead! As always, however, careful inspection reveals unexpected points of interest. I don’t know why this little guy is hanging around, but I bet it’s not accidental. 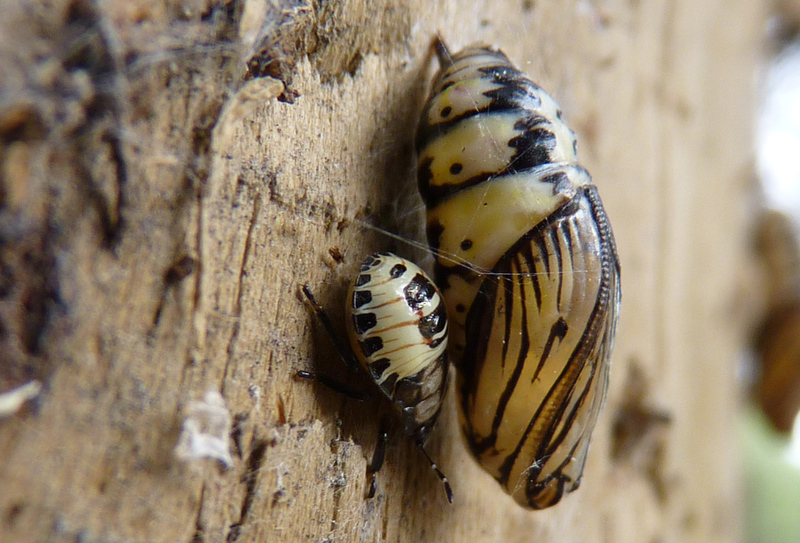 This one is surely an evolutionary mimic of the pupae. 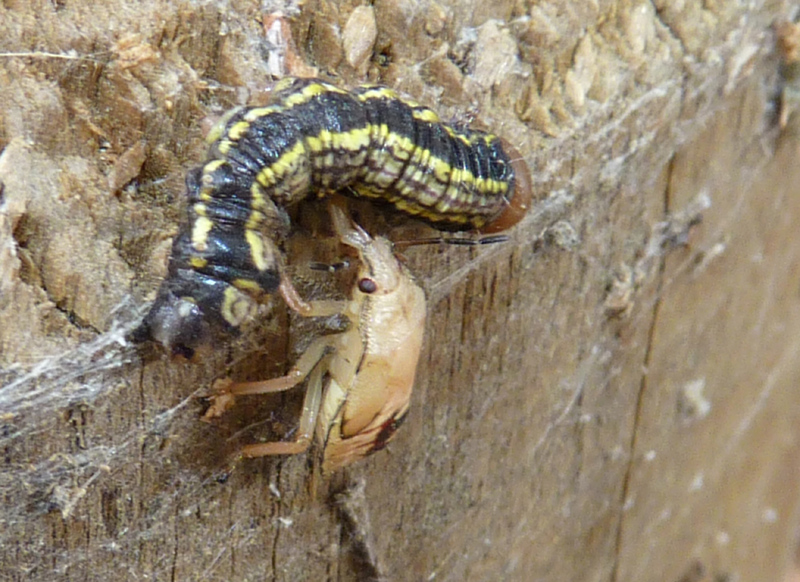 And getting right down to the bottom line, here’s one having lunch. From the dish, I walked back through Palo Alto and stopped at the Gamble garden to see what interesting things might be on display. 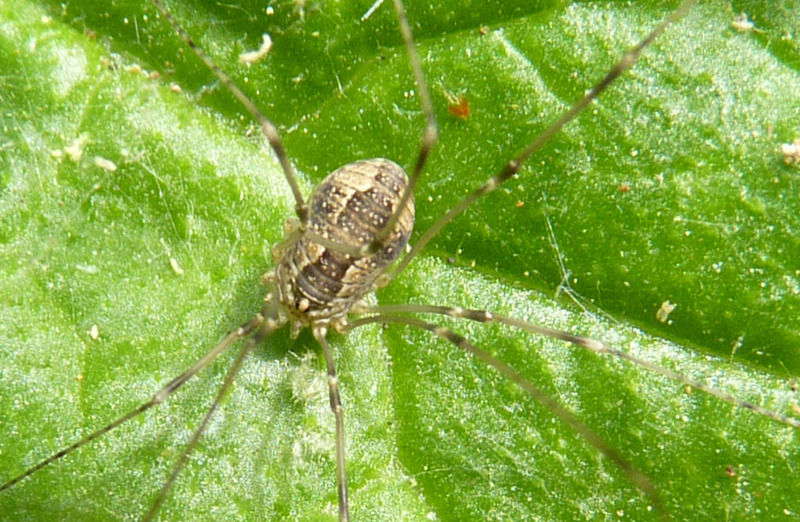 A couple days ago, I mentioned seeing more of various small animals over the years, more than in previous years, harvestmen for example. 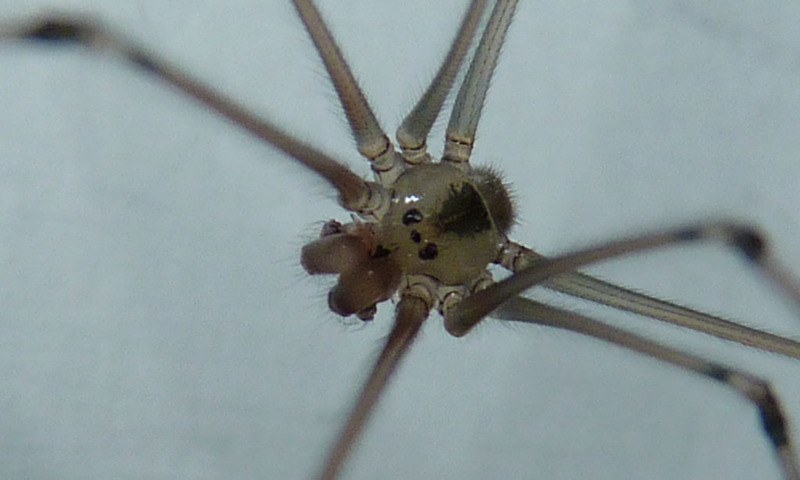 I have no reason to believe that there are more harvestmen than there used to be, but I see a fair number of them now. I believe this is because I have learned to see them. 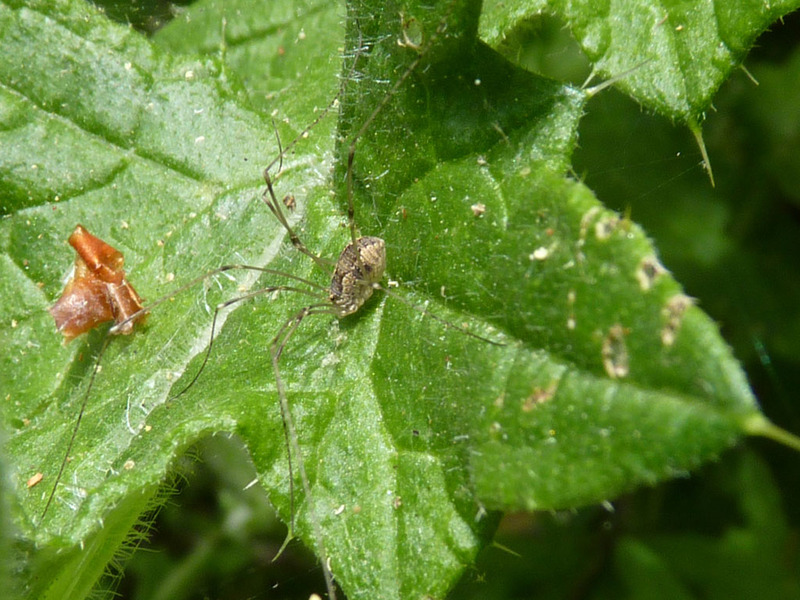 Spiders and snakeflies and harvestmen, oh dear! 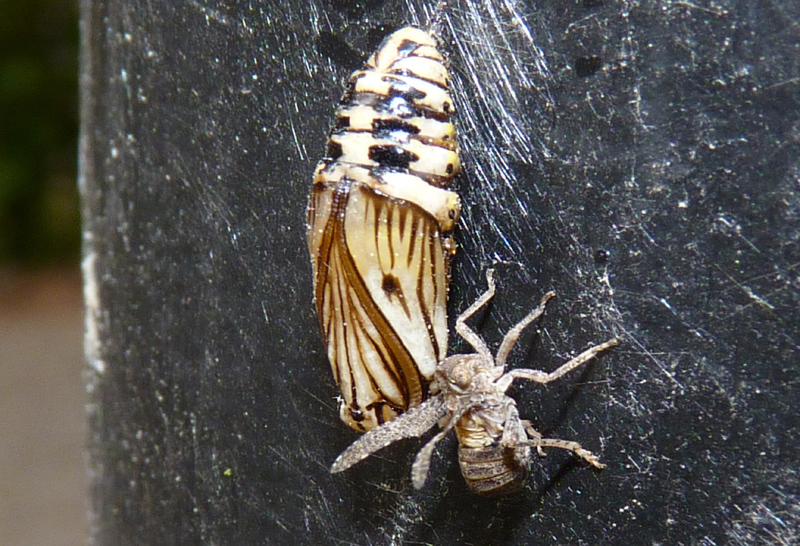 Some catching up to do… when last I updated the blog, we had a collection of spiderlings. While the ladder was out, I took the opportunity to photograph an adult or two. 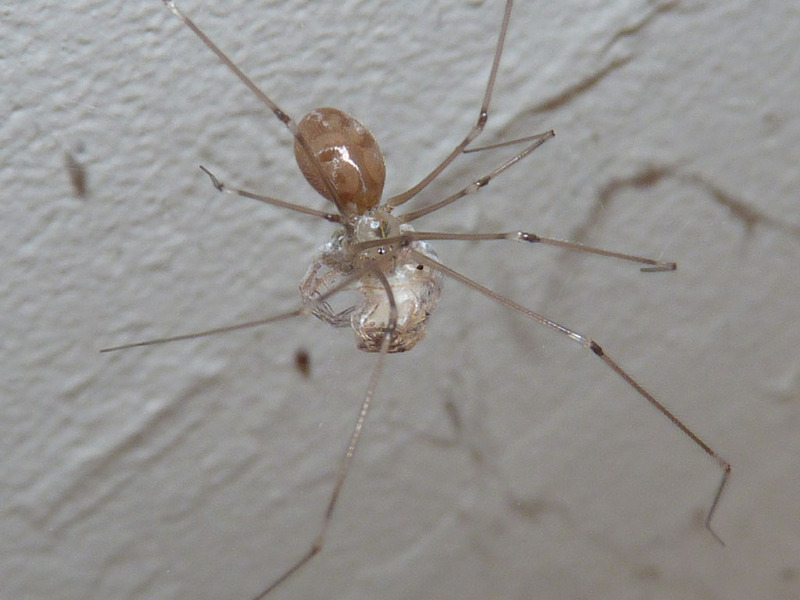 The photo below shows a spider that has just molted its skin! The old skin, there in front, and the new surface, light and shiny. That’s pretty cool. 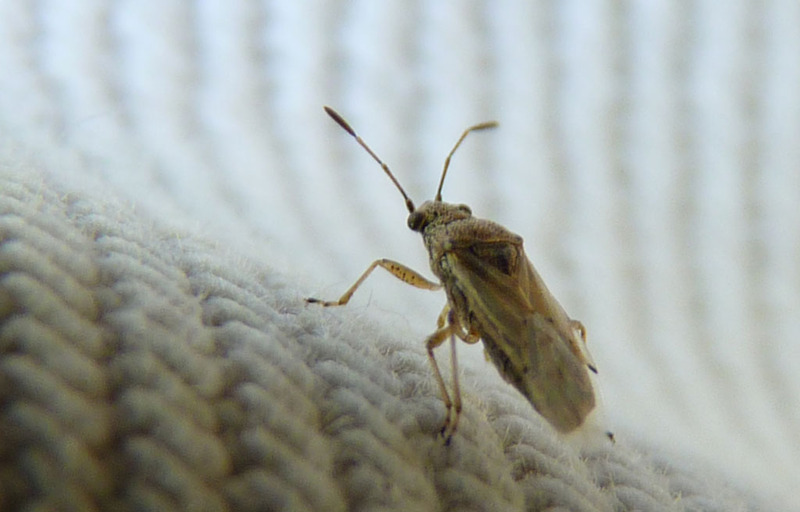 A few days later, I was sitting in the back yard soaking up a beer, when a little guy came along and perched on my pants leg. The weave of the cloth (below) gives you an idea how big he isn’t! 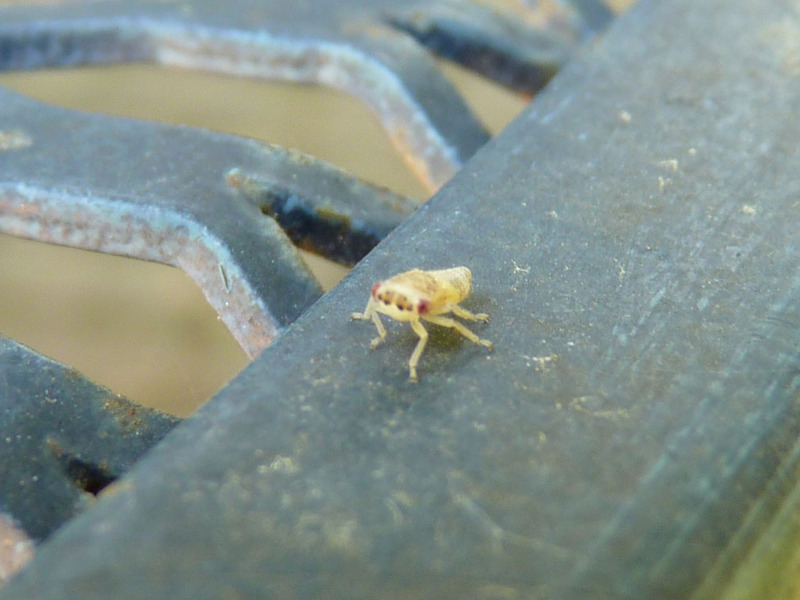 And this little fellow ran back and forth on the rim of the table for quite a while. 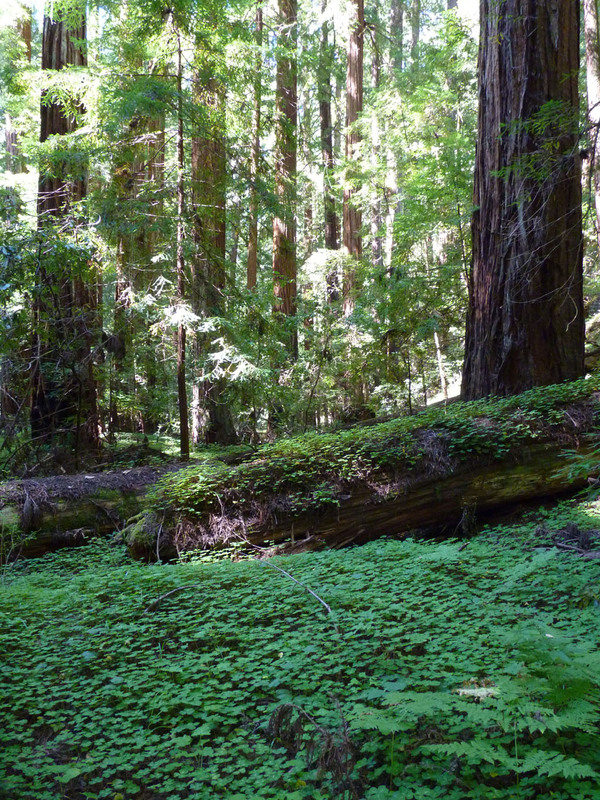 <time passes> I hiked Purisima Redwoods open space preserve with Albert, and the next day, Big Basin Redwoods state park. Nice hikes, but I have no photos to post. 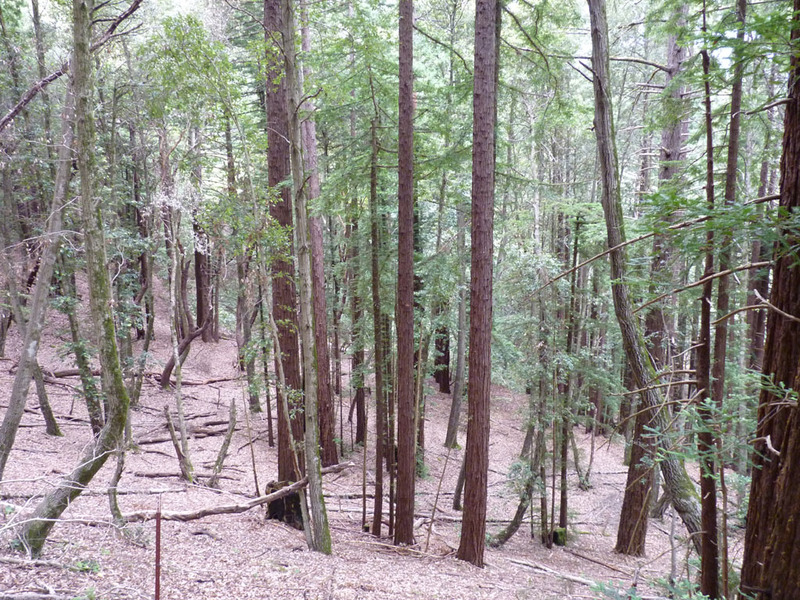 Today I left the car at the Wunderlich parking lot, hiked to Skyline, thence to Huddart park and back. As 22 mile hikes go, this one is pretty easy: one climb to Skyline, then along the ridge on a trail that is certainly not flat, but doesn’t gain or lose all that much extra elevation. 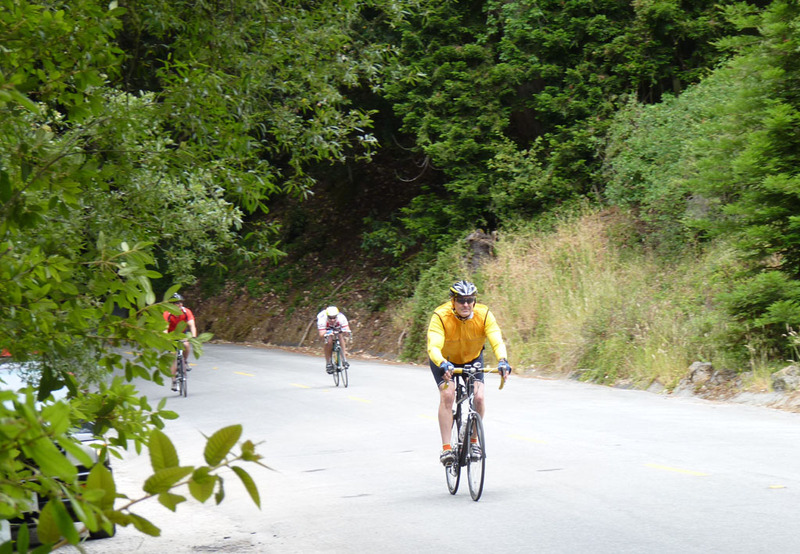 When I crossed Kings Mountain road, I stopped for a shot of the cyclists going down. They move right along. I asked Albert if he knew why trees grow in spirals (he didn’t). When I asked the question, we were looking at an example of a right-hand screw; we speculated that trees in the southern hemisphere might twist the other way. But here is possibly the most extreme spiral tree I have ever encountered, and it’s a left-hand twist. 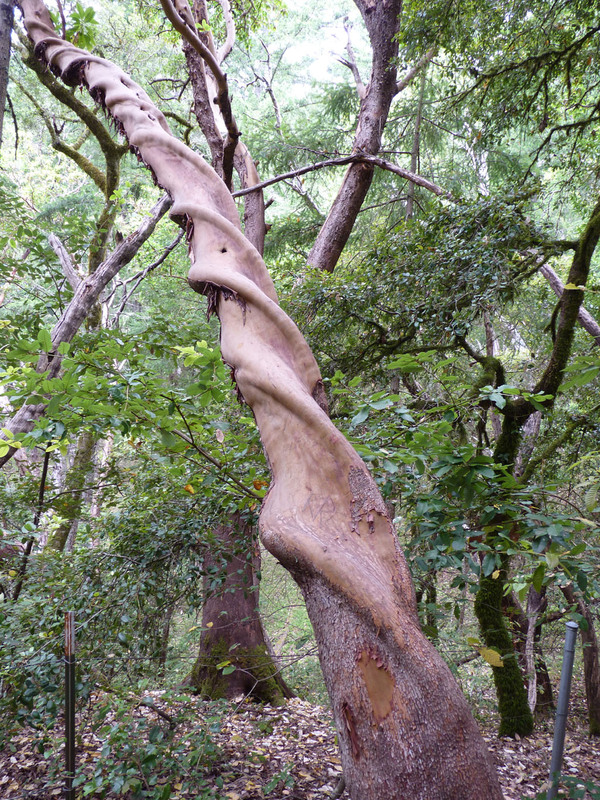 Most of the madrones around this area were also left-handed, although I saw some right-handed madrones further along. So maybe it’s just in the DNA. On the way back downhill in Wunderlich park, I stopped to inspect a growth of thistles along the trail. 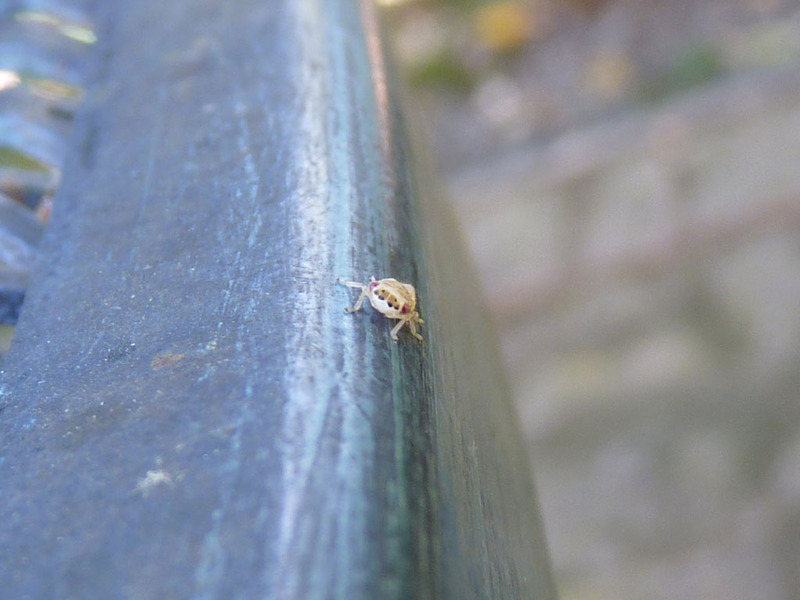 At first I thought this was a tiny mantis, but when you think about it, it’s clearly not a mantis. 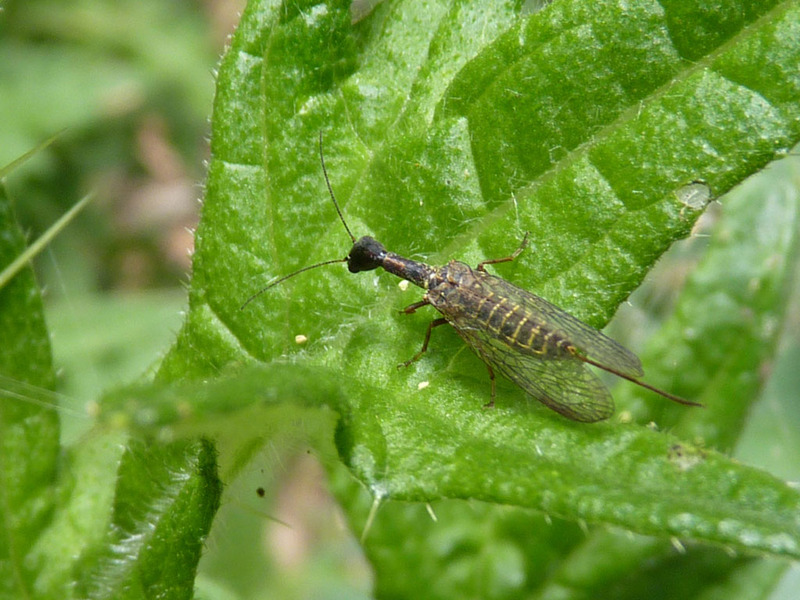 Upon research, I discover it’s a snakefly. 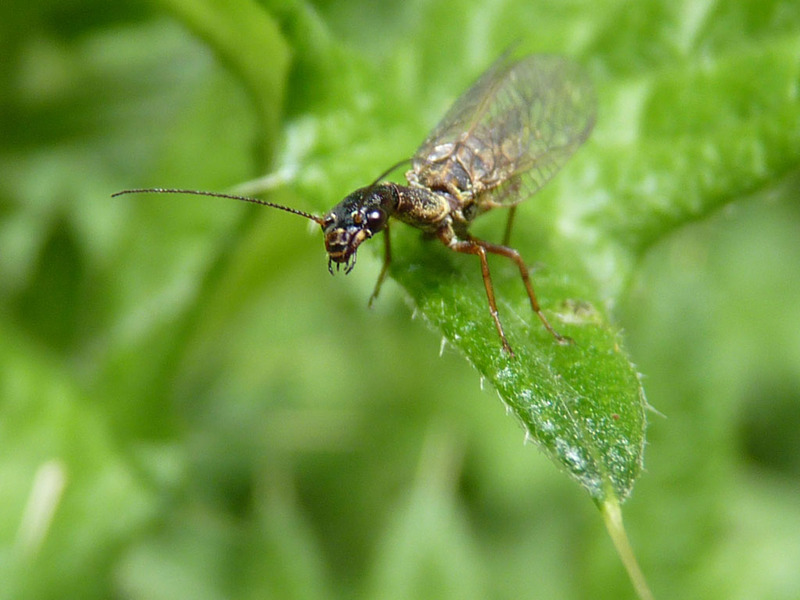 I don’t think I have ever heard of snakeflies before, and I’m sure I haven’t seen any. Carnivorous. 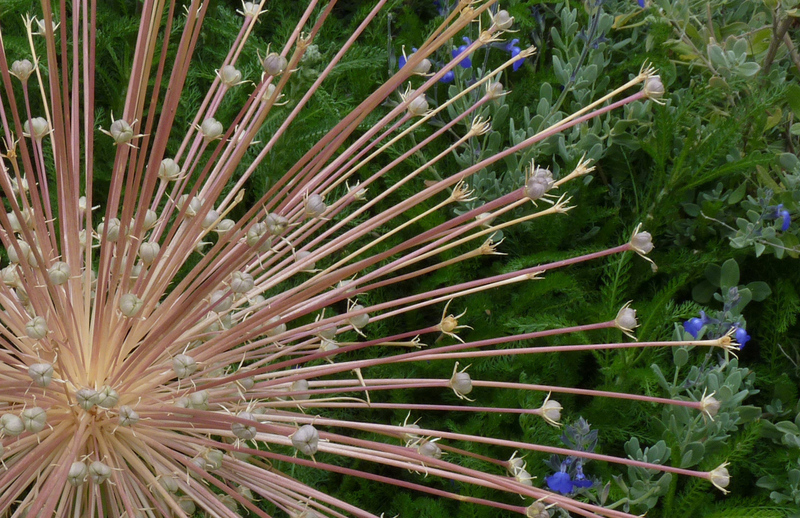 And in the same area — if you weren’t paying attention, you might think this was a spider. 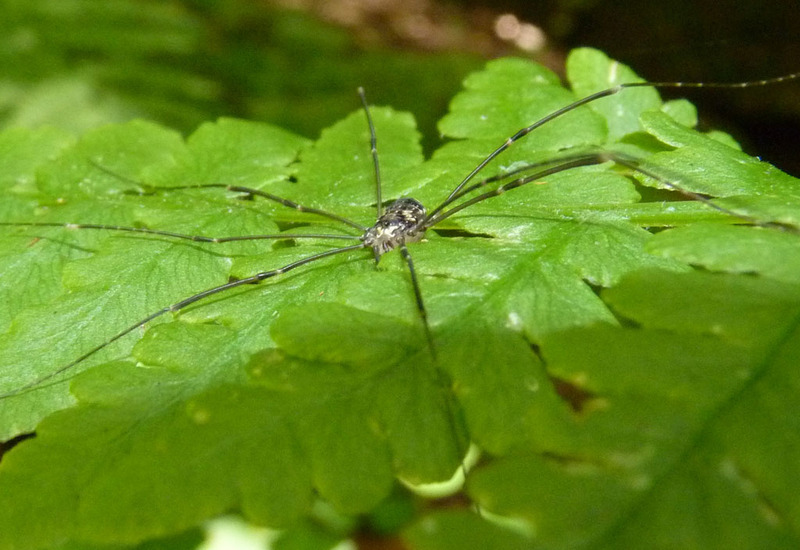 A harvestman, the other kind of daddy long-legs. 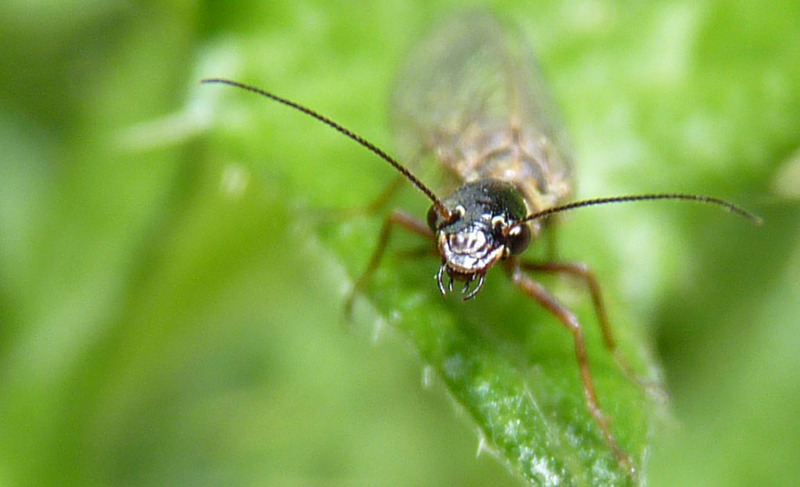 In this picture (above) we can see the little turret atop the head, with one eye on either side. 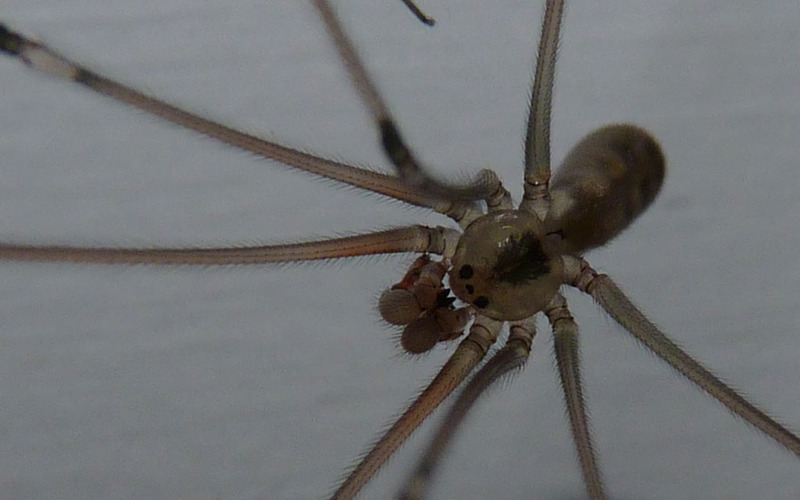 Spiders are considerably more advanced than this. 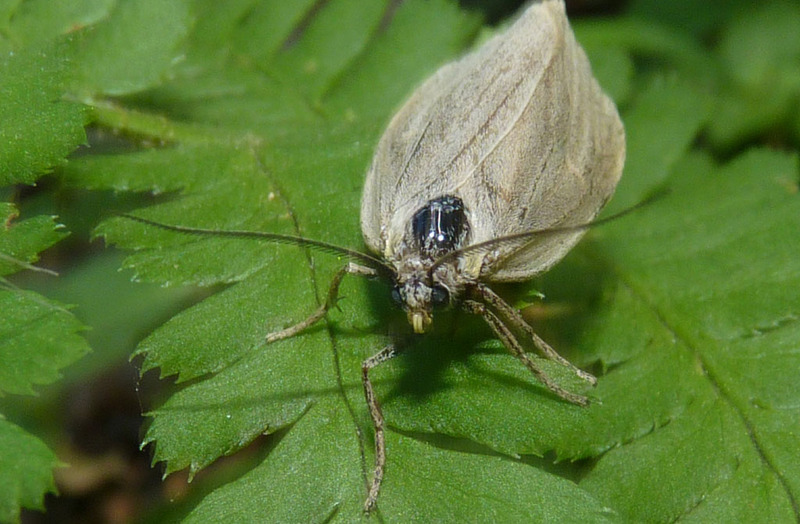 Finally, a moth; I liked the dual yellow lines of the rolled-up proboscis. This is the last hike for a while. Friday is for surgery on an Achilles tendon that has been giving me trouble for a number of years now. and I’ll be off the trails for a while. 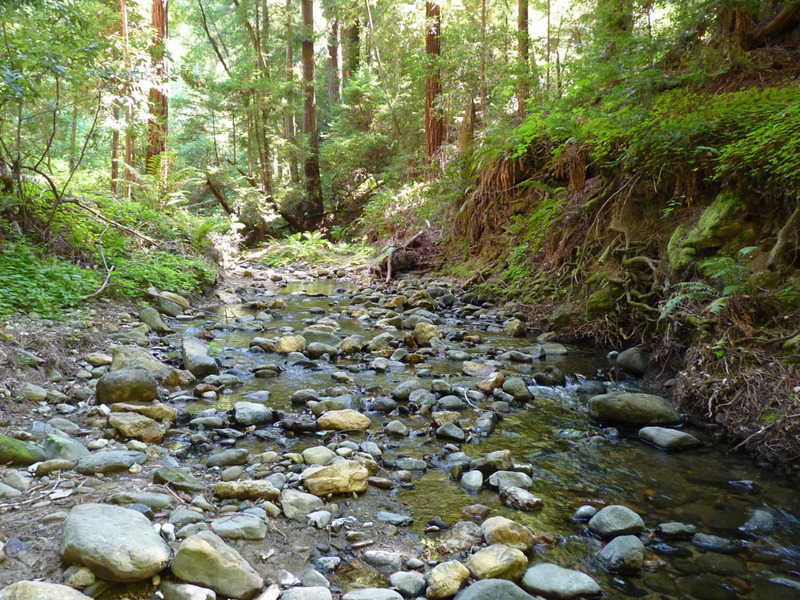 The real redwood forest begins about the time we cross Slate creek. At times, I have contented myself with the old Page Mill site as a destination, but it only took two hours to get there, and it was a nice day for a walk. Went on out Bear creek trail to the Peters creek loop, a really nice little excursion. Lots of poison oak, but I think (I hope) I was able to circumvent all of it. Steep downhill, about five hundred feet, into the Peters creek watershed. 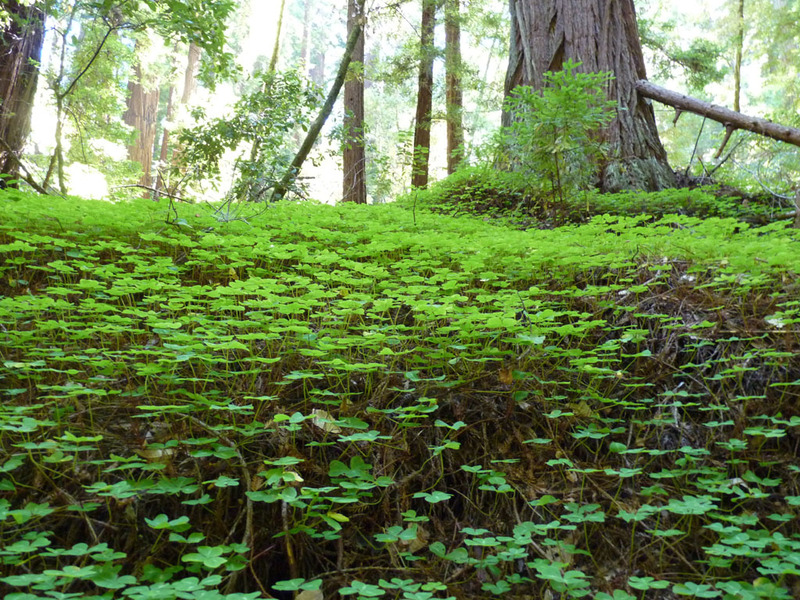 The ubiquitous oxalis gives the landscape a textured look. At this time of year, the creek is easy to cross. At the bottom of one of the quiet pools, I found a newt, just hanging out, keeping cool. 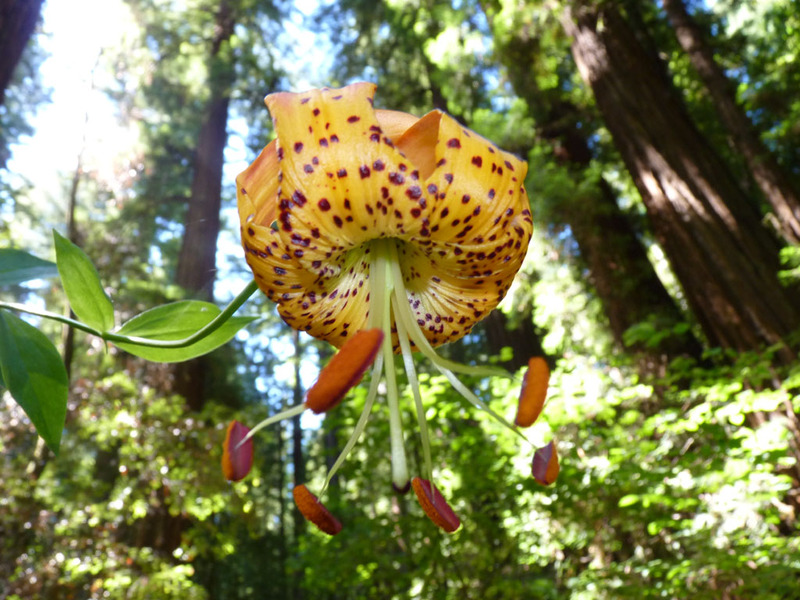 And one lily. Very nice indeed. When I stopped for calories, I noticed a little guy on a nearby fern. 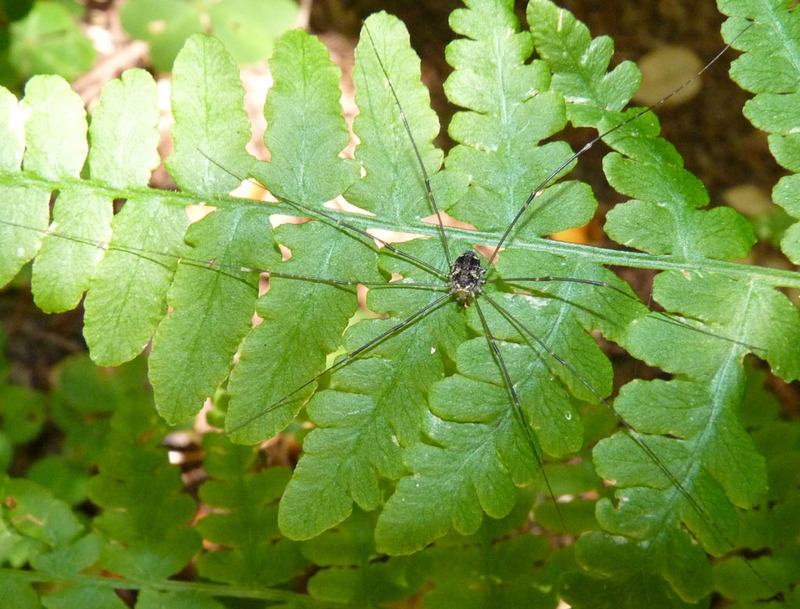 At first glance, a spider, but on second glance, it didn’t quite look like a spider. 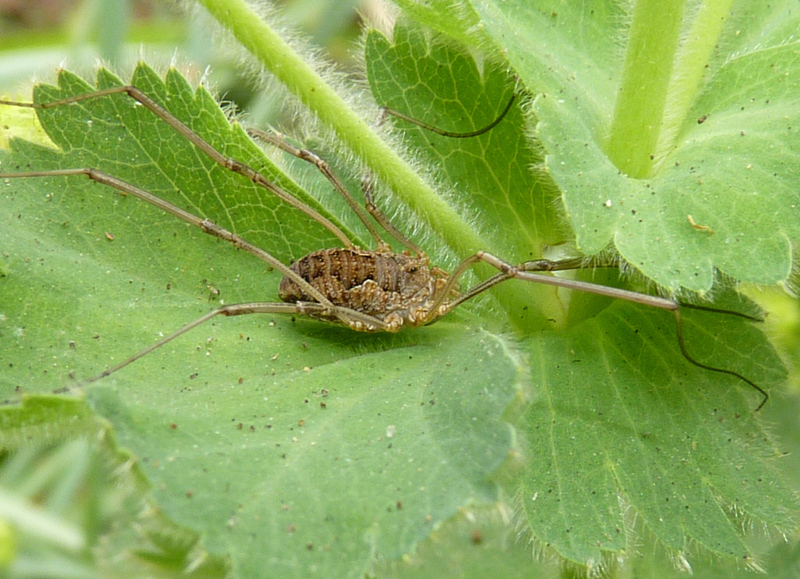 Sure enough, a harvestman. I didn’t actually know they existed around here, so this counts as a major discovery in my wildlife log!